Snow. It’s an essential reality in our mountain town. Whether we ski on it, need its water in summer, or move it around in plow trucks, snow on the ground translates to happy people. As the snow keeps piling up in parking lots and in your driveway, keep your eye on the prize: snow now means stream flows come summer. But just because it’s snowing and your brain is on fresh powder doesn’t mean you can’t—and shouldn’t—go fishing. Quite the contrary, now is a great time to fish. Here’s some insight to get more enjoyment out of your winter fishing. Adjust your mindset. This is a biggie. Winter fly fishing is a process. Grabbing a pair of sandals, a four weight, and a few dry flies won’t get it done. Most winter fishing in our area is walk-and-wade fishing, which may mean a personal gear audit and improvement. Simplicity is the exception—double nymph rigs, shelf ice, safety and access all play a role in the complexity of fly fishing in winter. It’s not mysterious, it just requires more effort. The silver lining is less people are willing to put on five layers of clothes and that translates to having most of the best holes to yourself. Learn the water-haul cast. Known also as the tension cast, this simple cast is effective for fishing clunkier rigs like a two-fly weighted nymph rig, and when you have obstructions limiting a normal backcast. At the end of your drift, allow the fly line to straighten out downstream of you. Raise your rod hand about head-weight, ensuring your submerged flies rise to the surface or slightly under the surface. When that happens, turn your wrist so your palm is parallel to the water’s surface. At that point make a normal forward casting motion, stopping it abruptly as you normally would. As you stop, be sure not to rotate your wrist any further forward and keep your thumbnail pointed up, not forward. Simplify your fly selection. I’m telling you to invest in gear, buy some fluorocarbon tippet, and learn a new cast, but at least you can carry fewer flies. On the Gallatin River your winter fly selection should include some size 10 or 12 coffee and black Pat’s Rubberlegs, some size 18 black and red beadhead Zebra midges, some size 16 or 18 firebead sowbugs or Czech nymphs, and your favorite size 18 mayfly nymph. Dry flies in winter are rare, but you still want to be prepared—like a baby boomer with Viagra in his wallet—so always have floatant and a few adult midge patterns in your box. A Griffith’s Gnat is the best performer, but any adult midge pattern in size 18 or 20 could entice the rare rising trout. 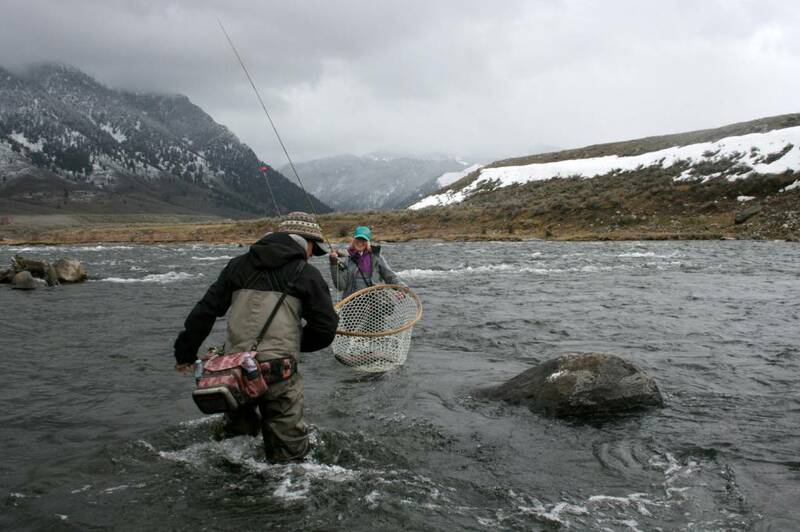 Dry flies are fun to dream about in winter, but most of your fishing will be subsurface. Is it wrong to think about fishing on a powder day? While guiding on the Upper Madison in high summer, I often tune out from watching a client make one bad cast after another to gaze at Lone Peak and pick the lines I’ll ski in six months. So, no, it’s not wrong to think about fishing on a powder day. Because if you’re like my last client, you can do both on the same day. Get after it the next few months. We are in the dream season now.